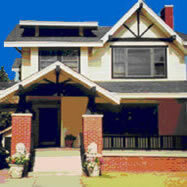 The Law Offices of F. William "Bill" Thetford, located in Oklahoma City, Oklahoma, serve individuals in the Oklahoma City metropolitan area and throughout Central, Western, and Southern Oklahoma. We have a toll free number for your convenience, and are available 24 hours a day, 7 days a week. Our firm represents people who have been injured in accidents involving motor vehicles, such as cars, trucks, and motorcycles, bicycle and pedestrian accidents, and those involving drunk drivers or hit-and-run. 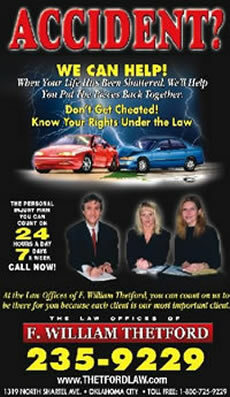 We also represent the families of people killed in auto accidents. Read more about our Auto Accidents practice. Your firm has done really well in representing me in my auto accident injury cases. If anyone needs an attorney for personal injury, I highly recommend you. I've used your firm many times and have always been satisfied and would use no one else. People aren’t just injured by cars – you may be hurt on the job, fall on a sidewalk, be injured by a defective product, or suffer from a doctor’s malpractice. Whatever the nature of your injury, we can help. We represent people who have been injured because of someone else’s negligence, carelessness, or even an intentional act. Read more about our Personal Injury practice. If you’ve been injured at work, you may be entitled to workers’ compensation. Workers’ compensation insurance covers your work-related injury, regardless of fault. You don’t need to prove whose fault it was, or even that it was anyone’s fault. If you have suffered a work-related injury, we can help. Read more about Workers’ Compensation. I was pleased with the services of Thetford Law Firm on my workers' compensation case and was very happy to get my settlement. While our firm focuses on helping injured people, whether it be by on-the-job injury, car, truck or motorcycle wrecks, dangerous products, wrongful death claims, medical malpractice, wrongful termination, social security, insurance bad faith, nursing home claims and other personal injuries caused by the negligence of others, please do not hesitate to contact us on ANY legal matter. If you or a friend need help for other types of legal problems such as bankruptcy, criminal defense, divorce and family law or other legal problems, please contact us and we will see that you find the right attorney whom we know, trust and associate with to help you. At the Thetford Law Firm our attorneys and lawyers represent clients from Oklahoma City (OKC), Tulsa, Claremore, Norman, Moore, Del City, Midwest City. Sulphur, Ardmore, Lawton, Enid, Shawnee, Owasso, Edmond, Guthrie, Mustang, Yukon and El Reno OK, as well as communities throughout Oklahoma County, Tulsa County, Cleveland County, Canadian County and Rogers County. Our attorneys specialize in the practice of personal injury law. DISCLAIMER: The information you obtain at this site is not, nor is it intended to be, legal advice. You should consult an attorney for individual advice regarding your own situation. All rights reserved. You may reproduce materials available at this site for personal use and non-commercial distribution. All copies must include this copyright statement.